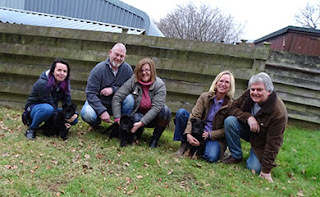 Having collected Tammy, Tara and Tag from Germany in early January it was time to make my way up to Glapwell in Chesterfield to collect 8 week old puppies Ollie, Ozzie and; Oscar from Richard Evans pictured here with the 3 boys and his wife Sue. 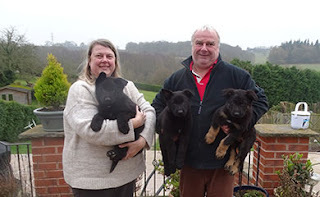 Richard an old friend of mine was the breed manager for the Thames Valley Police dog section for over 21 years and more recently also the Hampshire Police dog section on their amalgamation. He retired just over 18 months ago and moved up to Chesterfield near to his wife Sue’s relatives and took his female GSD Lola with him. This is her first litter which consisted of 3 boys and a female. I never heard so much as a peep from them on our 5 hour journey back to our house. 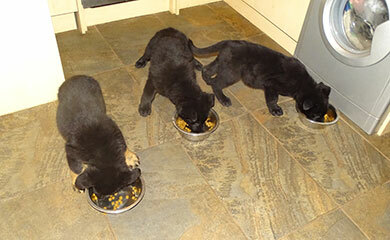 On our arrival 3 hungry pups made short work of their first meal in our kitchen. 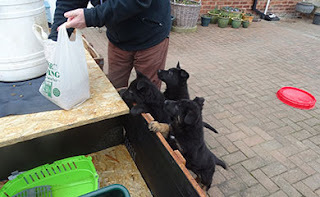 I had 3 excited puppy walking families eager to get their hands on them but because I didn’t get back until early evening I had to disappoint them by making them wait until the next day before allocating them. So they spent their first night together with me. 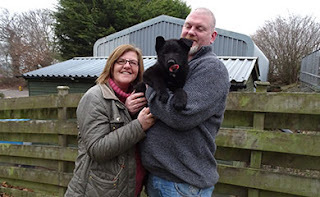 It is much better for them to spend as much time as possible on arrival at their new home to get them used to their surroundings to tire them out before their first night on their own. Again I never heard a peep from them all night and there was time for them to have a light breakfast and have a good play in the garden before going into the Police dog training school to meet their new puppy walkers. A quick individual photo then it was off to HQ. 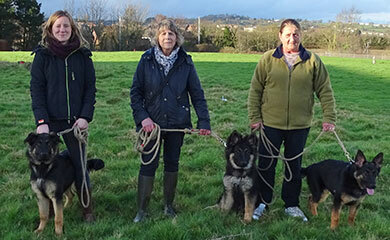 All of the puppy walkers for Ozzie, Ollie and Oscar are puppy walking for the first time. 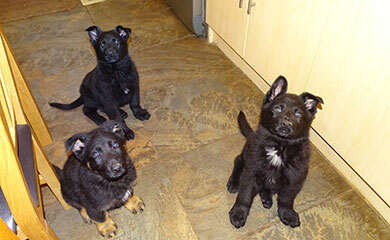 Before meeting the pups the puppy walkers were given a briefing and information pack and issued with their equipment and kit. 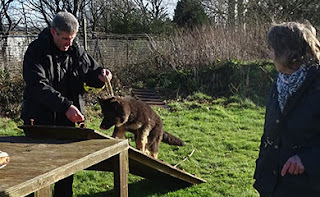 Part of the equipment includes a very large cage which will become the puppy’s sanctuary and private place for use in the house. It is very important the pup has somewhere he/she can go and be left in peace and also to get used to being left alone for short periods. 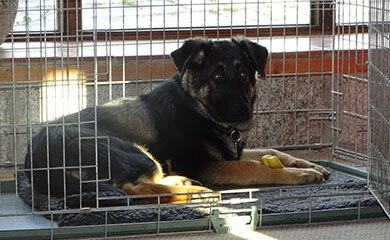 Tag is pictured here relaxing in his den on one of my earlier visits. To make it fair we had a draw to see who was going to have which puppy and then we all went outside to meet the pups for the first time. 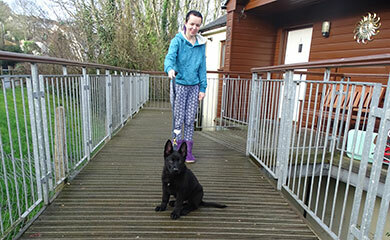 It was then time for some final photographs before the puppy walkers and their pups departed for their new homes in Marsh, Saltash and Newton Abbott. As always I checked the following morning to see how the pups had got on with their first night alone and found they all settled down fairly quickly and slept well. 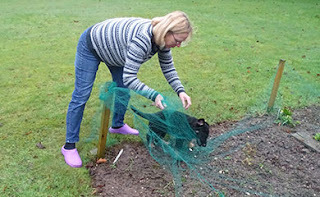 As is to be expected they had to be let out a couple of times during the night but other than that they were fine. 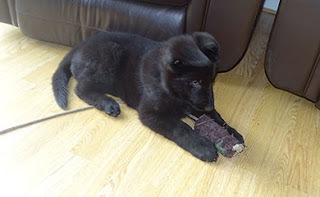 I had a puppy class with the D litter on the Sunday then visited the 3 new pups during the week to see how they were all doing. 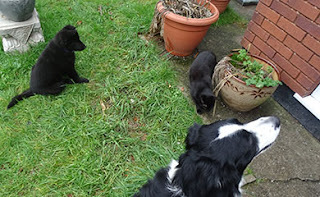 They had all settled in well and apart from a few toileting accidents and the usual mouthing and attempting to chew things they shouldn’t everyone was happy and relaxed. 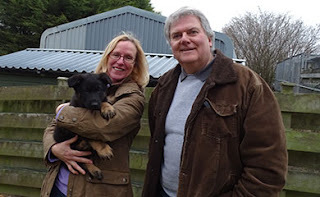 Here are a few photo’s of my visits. Oscar is pictured here getting involved in the car wash then after being moved on decided to dismantle the garden netting before finally falling asleep in the house. 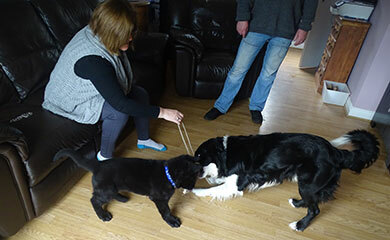 Ollie is pictured here playing with his new friend 10 year old border collie Jet as they contest who is the rightful owner of the tugger on the rope. It was no surprise to see who ended up with it. All 3 brothers clearly possess the will to win and have very determined characters which are necessary attributes for a Police dog. 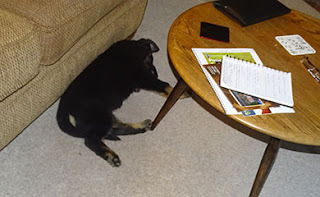 Ollie has certainly settled into his new home. Next was Ozzie and he was certainly no less determined and possessive than his 2 brothers. 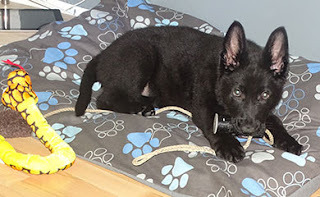 Every toy ends up on his little bed and this metal tube was no exception. 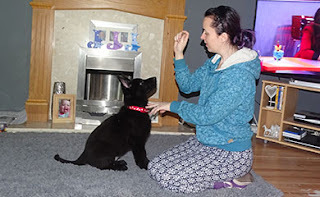 Marie has already started lots of games and exercises with Ozzie which will be very important in gaining his focus and attention. This will be invaluable later on in maintaining control over him and preventing him from getting into trouble and mischief. 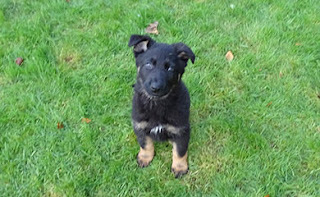 Then it was time to see me off the premises and I remember looking at this 9 week old pup and thinking he already has the look of a dog who is going to be very assertive and strong willed. I have to congratulate Richard on breeding 3 very excellent pups. 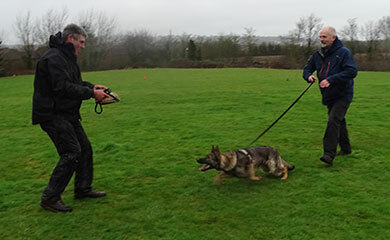 Their first training session will be on Sunday 19th February. The morning session was glorious sunshine. 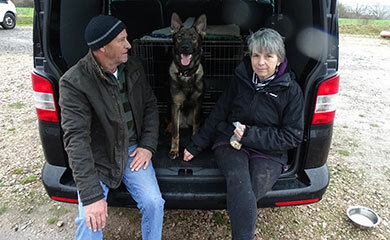 Here are Colin and Mitzi relaxing with Danno having elected to do the morning session. That all changed for the afternoon session with Mary and Dizzi game fully tracking through the driving rain. 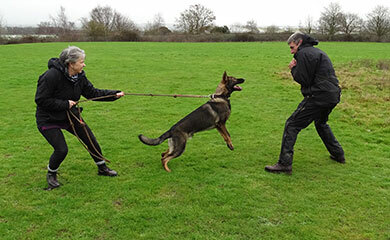 Here is Daisy looking like she meant business on her introduction to the bite pad with Eamon. 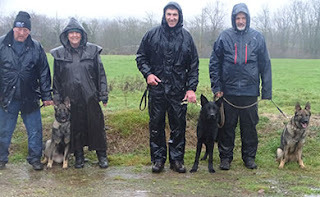 The D litter are now 8 months old and so we can now start to increase the level of difficulty on their tracking and search work as we prepare them for their September 2017 Initial Police dog course. 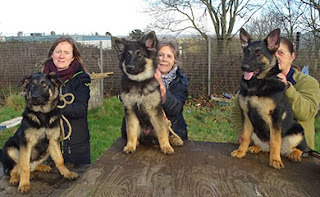 Tag, Tara and Tammy ( Now Helga ) were purchased for the January 2018 Initial Police dog course and with the addition of Ozzie, Ollie and Oscar we now have the 6 pups we require. We run 2 courses each year one in January and one in September. 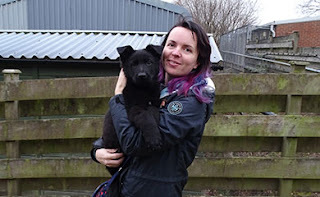 There are 4 places on each course but we always have 2 additional pups to cover for unforeseen circumstances such as orthopaedic issues , temperament problems or lack of working potential. With the recent retirement of our breeding female Ruby we now only have one breeding female Sasha and require a second female for our breeding program. This training session was the first opportunity to look at the working potential of our 3 German imports. We started with searching for a toy thrown into long grass. 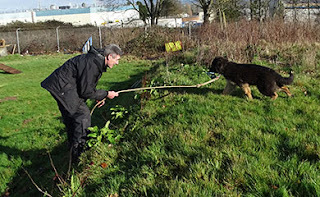 Here is Tara not only searching and locating the toy but also bringing it back. We then introduced them to the ramps and the tunnel. Here is Tag inside the tunnel and it was then difficult to get him out he enjoyed it so much. Here is Tara confidently making her way up the ramp. 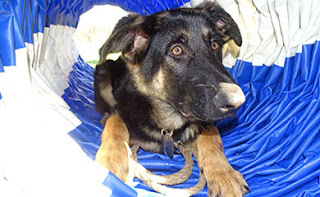 Tammy was a little cautious initially about going into the tunnel and up the ramps but with the inducement of some liver treats she quickly overcame her caution. 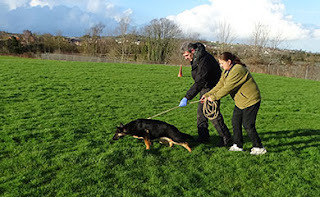 Next we introduced them to tracking which is following a trail laid by a person. 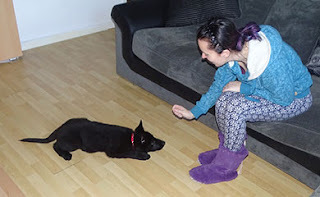 We do this by placing titbits into our footprints and the pup learns that following footprints is worthwhile. Tammy is pictured here quietly watching her trail being laid. Her patient and quiet demeanour gave no clue to just how tenacious and determined she was going to be once she was allowed to start the trail. Here are my first impressions of the pups after their first session. Tag is pictured here with Jo who is a first time puppy walker. Tag is a very laid back easy going pup who gives the impression expending energy is not one of his priorities in life. However if you press the right buttons he is very determined and focused. Strong nerves and not fazed by very much. Tara is pictured here with Jill one of our most experienced puppy walkers. 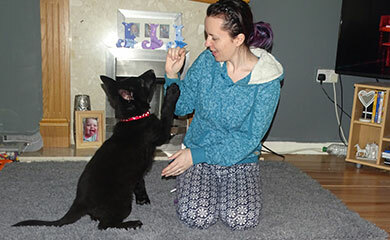 Tara is a happy outgoing bundle of energy who loves life and people. 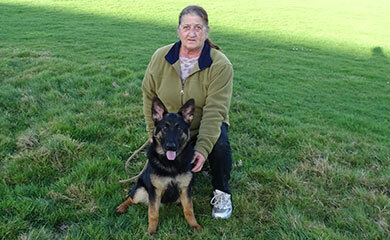 She has strong nerves and is extremely confident with everything she meets. 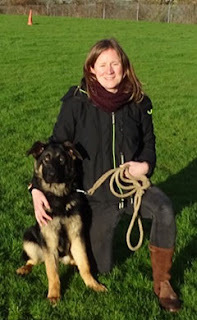 She has good work drives, is certainly no pushover and likes to have the last word. 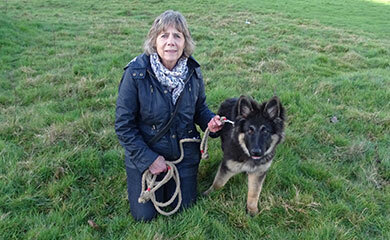 Tammy is pictured here with Margaret who is a first time puppy walker. 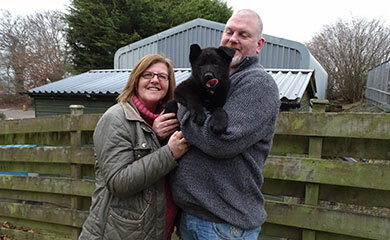 Tammy has a hint of caution in her nature but she does not back down from any situation. She is very strong willed and determined with very strong nerves. Her work drives are very strong. 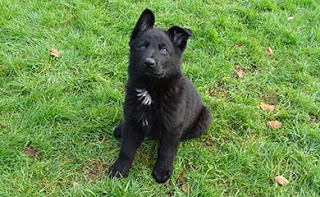 She strikes me as the most serious of the 3 siblings and provided her trainer or handler is patient in handling her caution she will be a very strong Police dog. 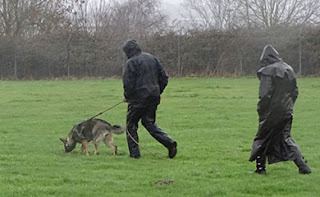 So having enjoyed their first training session it was time to go home. 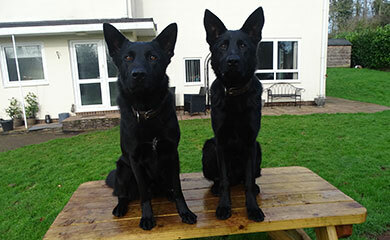 I will be training the D litter on Sunday and next week I will be spending time with the Initial course dogs. I still have Lenny with me having passed his Initial course in early December. 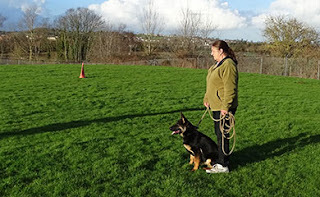 Unfortunately there are no handlers requiring a dog at the moment and so he will have to remain with me until there is. 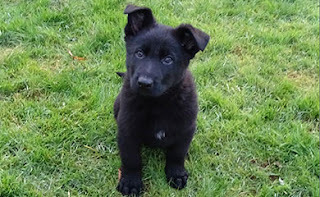 There are numerous Police dog sections who would like to take him but because of his outstanding tracking ability I want to keep him in force and also if the D litter prove to be successful I would want to use him again at stud. Rudi my Dutch import who lives with me, Lenny and Sasha is now 8 months old and is becoming a real handful. This is another reason why I would like to find a place for Lenny because Lenny is now starting to find Rudi very irritating. 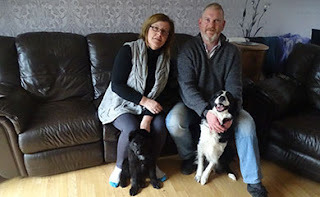 Lenny is on the left. Sasha meanwhile can’t be bothered with the boys as long as she has a toy in her mouth she is happy. In my next blog I will let you know how the Initial course are getting on and how Ozzie, Ollie and Oscar get on with their first training session.